John Warrick was well known before 1900 as the ‘Celebrated Machinist,’ being particularly interested in wheeled-vehicles. 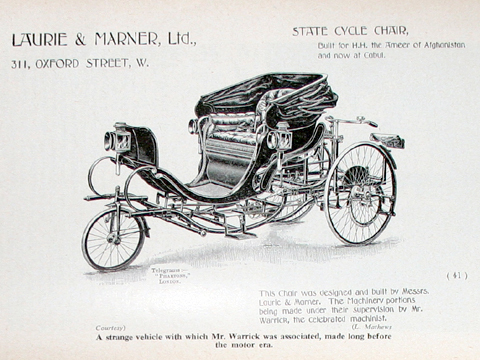 In 1896, Laurie and Marner, the carriage makers, of Oxford St, received an order from the Ameer of Afghanistan for a ‘state cycle carriage.’ This was a most astonishing contraption with two human engines pedalling behind the coach portion. The Ameer would appear to have been an impatient or sympathetic monarch inasmuch as he had his own set of pedals concealed beneath a trapdoor to assist on hills. The whole of this vehicle, excluding the coach body. was made by John Warrick. Does it still exist somewhere? 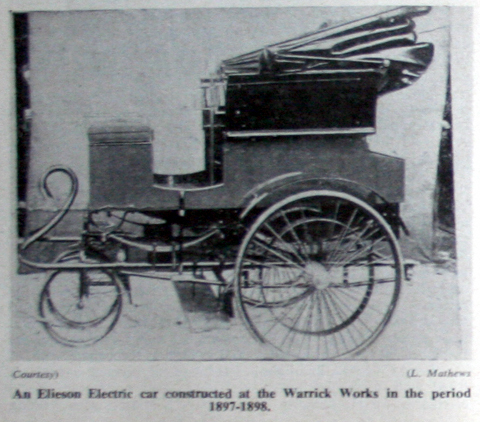 Another early vehicle made at the Warrick works was an electric carriage known as the Elieson. The coachwork was supplied by a local coachbuilder and the Elieson Lamina Accumulator Syndicate Ltd supplied the batteries. Several were constructed but never paid for as the above concern went into liquidation. 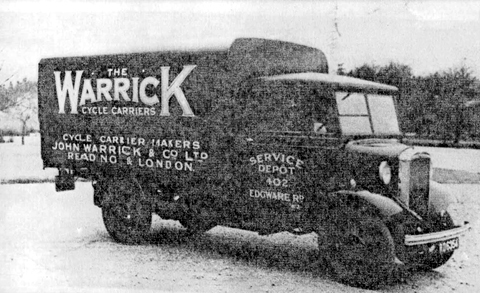 John Warrick had spent some time and money in designing this chassis and consequently he was rather peeved. After a few years the sight of the vehicles in the works so depressed him that they were broken up for scrap. The period of this venture was 1897/8. I couldn’t help buying one of these recently when I came across the advert below. It comes as a kit, so you have to build it, and it’s extremely small. In the early 1900’s businesses were looking for more economical ways of delivering their goods. One of the ideas put forward was the motorised delivery tricycle.These small, light delivery vehicles were ideal for the distribution of parcels within towns and cities. They were driven by lads in their early teens which helped keep running costs down. Many small businesses used them, particularly butchers and grocers who had to deliver a lot of small items over a wide area. In 1910 the GWR bought three such vehicles for use within London delivering parcels and advertising material.